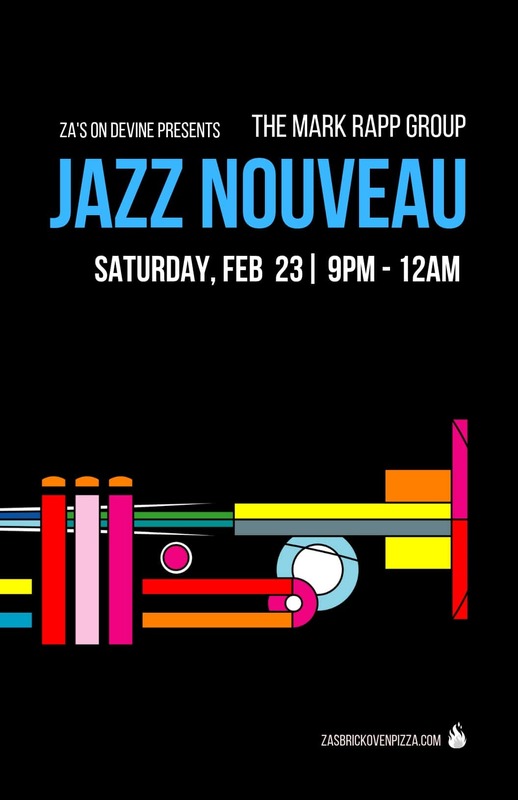 Enjoy a late night set of jazz tunes by the esteemed Mark Rapp Group, Saturday, Feb. 23, 9 p.m.-12 a.m. at Za’s on Devine. Enjoy the Mark Rapp Group’s “Jazz Nouveau” style ft. groovy, funky and upbeat renditions apart from your typical jazz genres. Plus a jazz lounge atmosphere in the Za’s dining room with dim lighting, jazz-themed cocktails and more. Mark Rapp is an appraised trumpeter, composer, touring artist + founder of ColaJazz — a group that supports and promotes the jazz community in and around South Carolina. He has played at jazz clubs and festivals nationally and internationally and was recently honored as an SC Jazz Ambassador in 2018. You can learn more at http://markrapp.com/ or https://colajazz.com/. Music begins in the back dining room by the bar at 9 p.m. Themed cocktails + a full bar and food will be available for purchase. Get social – tag your posts, photos and videos with #ZasonDevine. Join us on February 23!